Bowen, C. (2011). 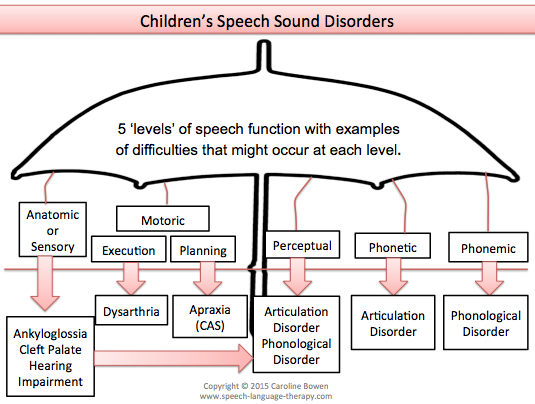 Classification of children's speech sound disorders. Retrieved from www.speech-language-therapy.com/index.php?option=com_content&view=article&id=45 on [insert the date that you accessed the file here]. Shriberg and colleagues' subtypes of Speech Sound Disorders (SSD) are based on genetic and environmantal risk factors (Shriberg, Potter & Strand, 2011). Dodd's approach is around linguistic profiling and linguistic subtypes. These and other classification systems are discussed by Bowen (2015) Chapter 2. Clinicians tend to use simplified, 'family friendly' terminology when explaining to families how SSDs are classified. The example of a simplified approach that is included below is the one used by the author, and modified to suit individual families, over many years of clinical practice. Note that within each classification system one or more types of SSD can co-occur (be present in the same child). All phonological rules or processes evident in a child’s speech output are attested in typical development, but are characteristic of children younger than the child in question. Children have co-occurring non-developmental or unusual errors and developmental rules or processes, with the presence of unusual processes signalling that the child has impaired understanding of the target phonological system. Children exhibit delayed and non-developmental error types and variability of production of single word tokens ≥40%. Children are unable to produce particular perceptually acceptable phones. Children with CAS have ‘deviant’ surface speech production patterns that may sound similar to those of children with inconsistent speech disorder, but they are different in proposed level of breakdown and in symptomatology. Note that Dodd uses the term 'DVD' (developmental verbal dyspraxia) in the first edition of her book and 'CAS' in the 2005 (second) edition. This involves difficulty producing one or just a few speech sounds, e.g., /s/, /z/, /l/, /r/. Another term for this is Functional Speech Disorder. This involves persistence of errors that are typical of younger children’s speech, e.g., producing ‘front sounds’ at the back of the mouth (tea pronounced as key, duck pronouncd as guck) or omitting consonants (boot = boo, snow = no), or omitting syllables (Thomas = Tos). These include speech difficulties due to Childhood Apraxia of Speech (difficulty planning movements for speech) and the dysarthrias (difficulty making movements for speech due to paralysis). These include speech difficulties associated with head/facial anatomy differences (e.g., cleft palate, misaligned teeth, or the craniofacial differences associated with some syndromes). These include speech difficulties associated with syndromes such as Down syndrome, metabolic conditions such as galactosemia, and sensory conditions such as hearing impairment. Each ‘level’ of difficulty (anatomic or sensory, motoric, perceptual, phonetic, phonemic), and each type of difficulty (speech that is characterisitic of children with ankyloglossia, cleft palate, hearing inpairment, etc. ; dysarthria; Childhood Apraxia of Speech (CAS); articulation disorder; phonological disorder); depicted above can co-occur in the same child. For example a child might have a primary speech diagnosis of CAS and also have some phonologically based errors and some perceptual errors. John aged 4;6 had poor speech intelligibility, with his parents only understanding 75% of what he said. He appeared to have some difficulties with a sensory basis as he had a history of intermittent conductive hearing loss due to otitis media with effusion when he was between 12 and 18 months of age through to the age of four. John also had difficulties with a perceptual basis, and was unable to discriminate /l/, /ɹ/ and /w/ at word level, becoming confused with word contrasts like lip, rip and whip. As well, some of his difficulties had a phonetic basis; he was unable to articulate /k/ and /ɡ/ and /ŋ/. Furthermore, John had difficulties with a phonemic basis: while he was able to produce all the fricatives, and the stops /p/, /b/, /t/ and /d/, he was ‘stopping’: replacing all fricatives with stops, e.g., ‘dit’ for ‘sis’, 'dit' for 'fish', and 'do' for 'zoo'. Meanwhile, Shahrina, 6;0, had a repaired cleft palate (anatomic), a mild sensorineural hearing loss (sensory) and Childhood Apraxia of Speech (motoric). Cite this article as: Bowen, C. (2011). Classification of children's speech sound disorders. Retrieved from www.speech-language-therapy.com/index.php?option=com_content&view=article&id=45:classification&catid=11:admin&Itemid=121 on [insert the date that you accessed the file here]. Cite the 'SSD umbrella' illustration as: Bowen, C. (2015). Five levels of speech function with examples of difficulties that might occur at each level. Retrieved from www.speech-language-therapy.com/index.php?option=com_content&view=article&id=45:classification&catid=11:admin&Itemid=121 on [insert the date that you accessed the file here].